SOUTHINGTON - The Southington Town Council is planning a community conversation about tolerance after controversy caused by a racist video posted by a student in December. 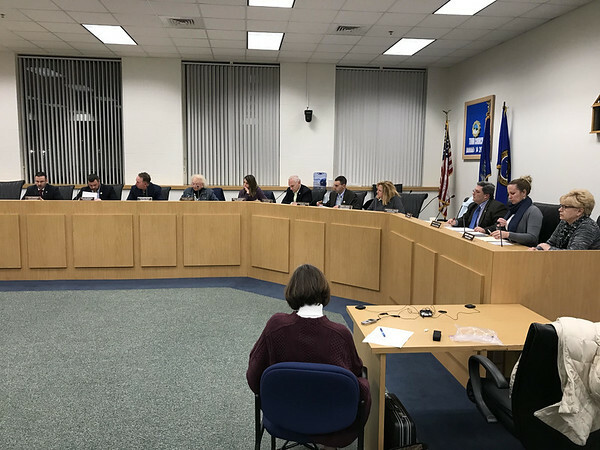 At the start of Monday’s meeting, the council rose in solidarity as council Chairman Chris Palmieri read a proclamation stating that the Town Council opposed racism and that it isn’t what the community is about. Councilor Victoria Triano, who is also a local pastor and a member of many interfaith organizations, said that she aims to spearhead the community conversation initiative, which she said would meet more than once. She is also working with Superintendent of Schools Tim Connellan, Board of Education Chairman Brian Goralski and other groups. “Our focus will be to make a good town a better town,” she said. Triano said that she was in Italy when she received a call and emails from Town Manager Mark Sciota about the incident in which a 17-year-old student posted a video on social media threatening black students. He was charged with breach of peace and his case was then sealed. The Town Council also approved an architect for the planned repairs to Southington High School’s roof: Hibbard & Rosa, of Middletown. Chris Palmieri said that they were the low bidder at $14,000, which was $2,000 less than the next lowest bidder. Triano said that the section of roof over the foyer at the school is old and needs to be replaced. In the future, solar panels may also be added to the roof but this is the first stage of upgrades. Additionally, the Town Council voted to approve that coordination for the fall’s Apple Harvest Festival will be conducted by Dave Laprey, recreation director. He was awarded a $15,000 stipend for the town to organize the event. Additionally, town secretary Julia Berordinelli has been awarded a $5,000 stipend to assist him. The town also approved $30,138.50 to match a grant from the Community Foundation of Greater New Britain which will help Mark Ramsay of Lewis Educational Agriculture Farm to construct a greenhouse that will allow him to continue growing during the winter. “This will not only allow him to continue his educational programming for kids during the winter months, but it will also allow him to turn a profit during the winter,” said Triano. Triano said that Ramsay is expected to begin building the greenhouse as soon as the materials arrive. Posted in The Bristol Press, Southington Herald on Thursday, 17 January 2019 18:45. Updated: Thursday, 17 January 2019 18:48.